This recipe is a family favourite, passed on from my grandma to my mum, and now to me:) It's a great 'winter warmer' recipe, and also really good if you have a lemon tree and a glut of lemons you need to use up. 6. Fold egg whites into the batter (the egg whites are the secret to keeping the Lemon Delicious light and fluffy). Pour mixture into ramekins. 7. Pop ramekins in a baking tray and fill with water (halfway up the sides of the ramekins). 8. Bake for 25 mins. 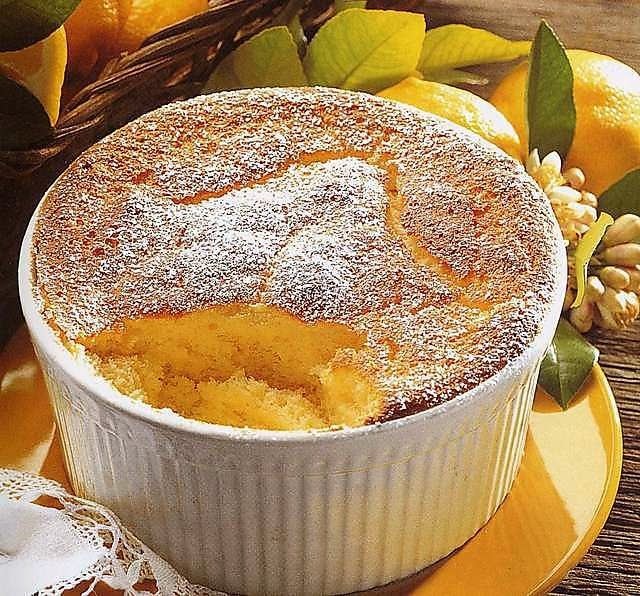 Chef's Tip: I like to bake my Lemon Delicious in ceramic ramekins (like the ones in the pic above), but I usually invert them onto a plate or bowl and let the yummy lemon custard run down the sides of the fluffy sponge underneath. Serve with icecream or cream.